A graduate of the prestigious Parsons School of Design, Susan began her career as a high fashion illustrator for Womens Wear Daily and Glamour Magazine. After her stint in the fashion world, Susan went on to teach in various New York art schools. Tired of years of hectic city life she was ready for a change of pace and a warmer climate. Having vacationed in the area Susan and her husband moved to St.James Plantation. “Since coming to North Carolina I’ve been able to concentrate solely on painting. I was inspired by the Coastal area and longed to paint the boats and marsh scenes. Now that I’ve painted so many landscapes, I’m starting to loosen my approach as I find new subjects"
Now, instead of sketching models, she paints landscapes, waterfronts and marshes. Her paintings are free and loose, yet detailed. Her palette is bold, colorful and expressive. Aa a Watercolorist, her style is uniquely her own. 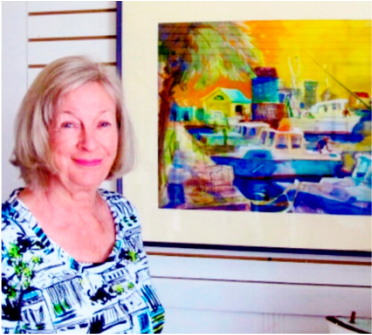 Her work is in many private and corporate collections including The Brunswick Co. Courthouse, Dosher Mem. Hospital, Allegacy, UNCW, and Coldwell Banker. Represented at Ricky Evans Gallery Southport,Sunset River Marketplace Calabash, Collectors Cove and The Artisans Gallery at St.James. see additional work at www.susandade.com .